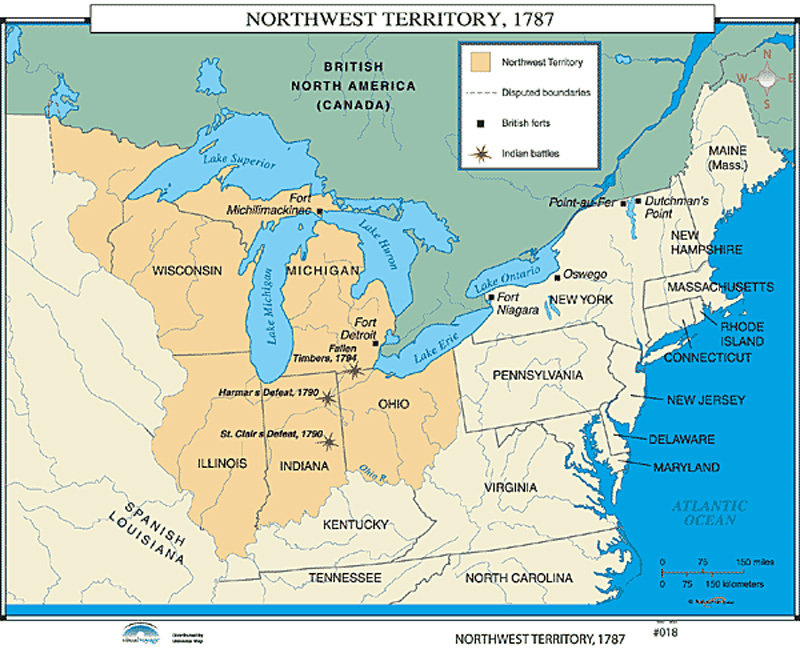 Indiana was one of six states that were created from the Northwest Territory, an area of approximately 260,000 square miles that had been a part of Québec in British North America. 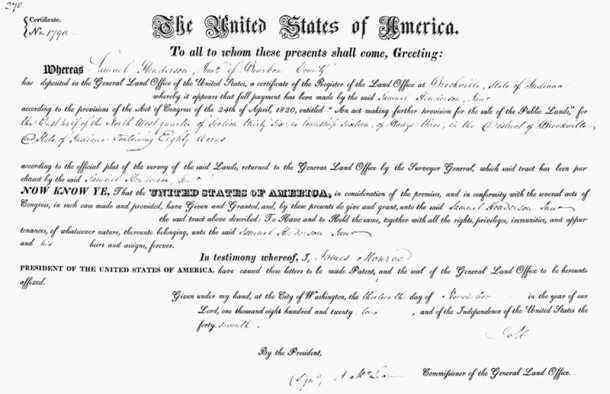 The United States of America purchased the land from the British in 1787, fewer than four years after the end of the American Revolutionary War. 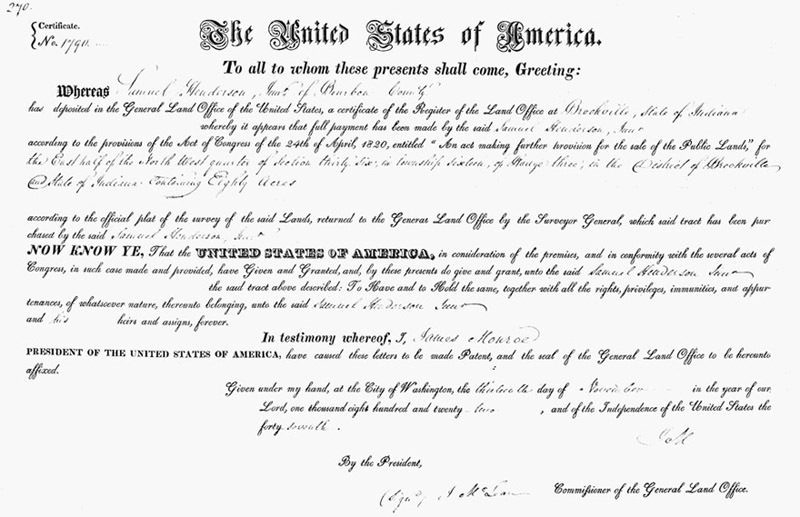 Following Indiana’s admission to the Union in 1816, the newly established state governnment mounted numerous projects to build roads, canals, railroads, and schools, in an effort to make it more desirable for people to move to Indiana. On November 13, 1822, Samuel Henderson purchased the land on which 1713 N. Delaware Street now stands from the federal government, although the subject residence wasn’t built until more than seven decades later. Henderson’s purchase was one of two adjacent 80-acre tracts that the Kentucky-born Henderson obtained from the land office in Brookville, Indiana. 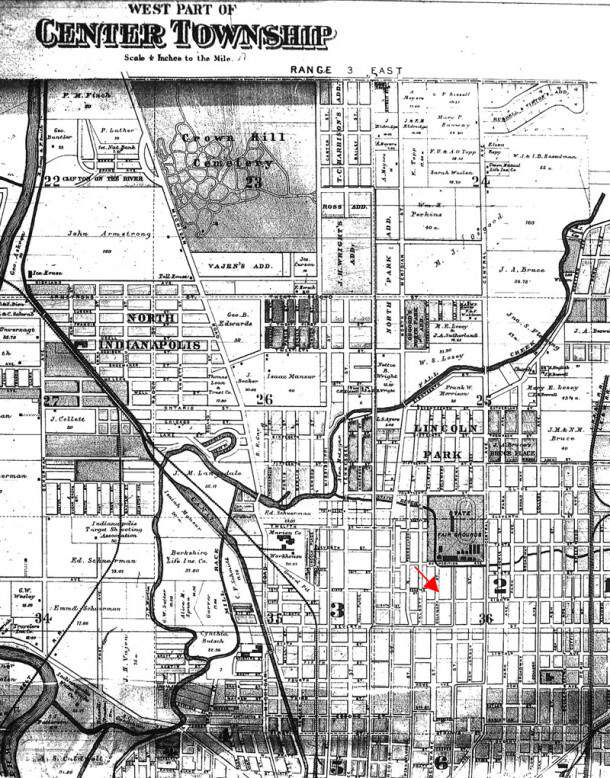 Henderson’s 160 acres were between what is now 16th Street on the south and what is now 21st Street on the north, and from what is now Illinois Street on the west to what is now Park Avenue on the east. In 1835, Henderson also acquired additional land just north of these tracts, by purchasing acreage from its original owner, Thomas O’Neal, who had also obtained a land patent in 1822. Samuel Henderson became the first Postmaster of Indianapolis (1822-1829), as well as the first Mayor of Indianapolis (1847-1849). A brief biography of Samuel Henderson can be found in John H. B. Nowland’s 1870 book, Early Reminiscences of Indiana, here. In 1850, Samuel Henderson and his wife Nancy sold the western portion of their land to Elizabeth (Coram) Tinker. Elizabeth Tinker was the wife of William Tinker, a sea captain. The Tinkers had a son, John, and two daughters, Elizabeth and Mary. Elizabeth Tinker married jeweler Washington H. Talbott, and Mary Tinker married banker William H. Morrison. When the land was platted by Tinker’s older daughter, it became the Elizabeth Talbott Revised Addition. Most of the lots still retain that same legal description to this day. In 1886, the Tinker homestead, also called Talbott Place, became the residence and studio for revered Hoosier artist Theodore Clement Steele. 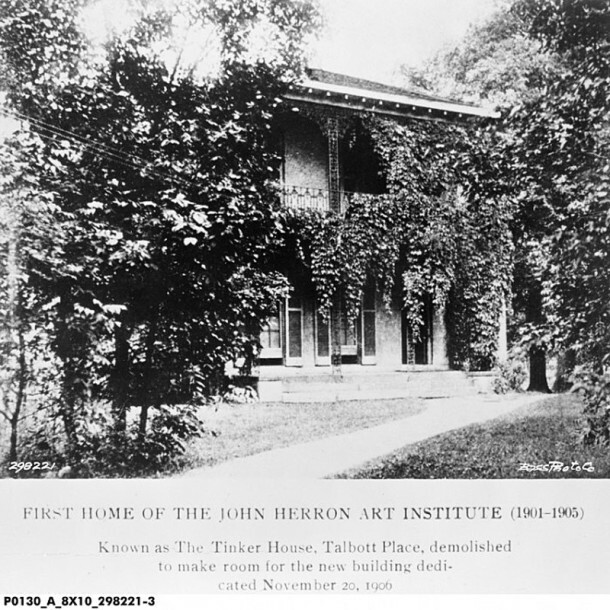 In 1902, with a bequest from the estate of John Herron, T. C. Steele’s studio became the first home of the John Herron Art Institute. In 1905, the Tinker house was demolished to make way for the construction of a new building. 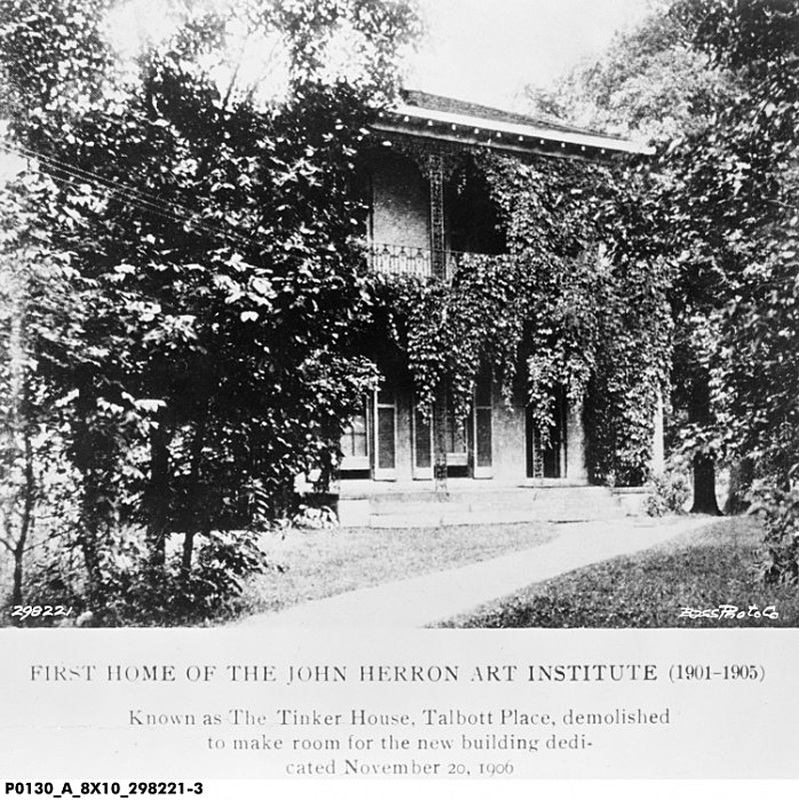 Designed by architects Vonnegut and Bohn, the John Herron Art Institute also became the first permanent home of the Art Association of Indianapolis in 1906. It was renamed the Indianapolis Museum of Art in 1969, just prior to its relocation to the present-day grounds at 4000 Michigan Road. In 1850, Samuel Henderson and his wife Nancy sold the eastern portion of their land to William A. Otis. In 1859, Otis sold some of that acreage to the State of Indiana to create a permanent home for the Indiana State Fair. When the Civil War broke out in 1861, then Governor Oliver Perry Morton requisitioned the use of the new fairgrounds as an induction facility for Union soldiers. 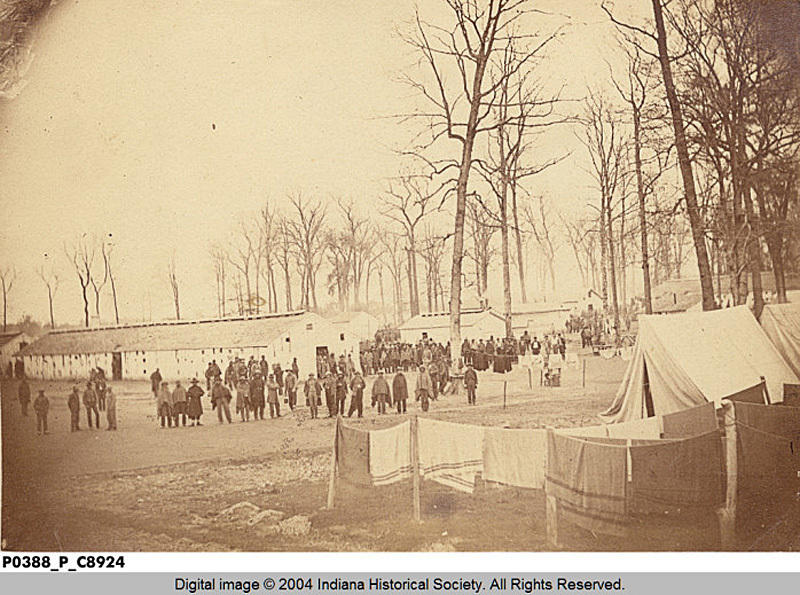 Named Camp Morton, in 1862 it became a prisoner-of-war camp for captured Confederate soldiers. Union troops were stationed immediately south of Camp Morton, to guard the prisoners, an encampment that was known as Camp Burnside. After the war ended, the Camp Morton land resumed its original purpose as a fairgrounds, until the Indiana State Fairgrounds that we know today was established in 1890. 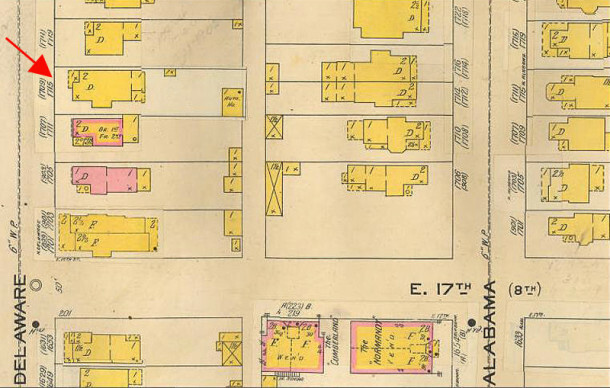 In the 1880s, the former Camp Burnside was divided into building lots with the legal description of Allen and Roots North Addition. 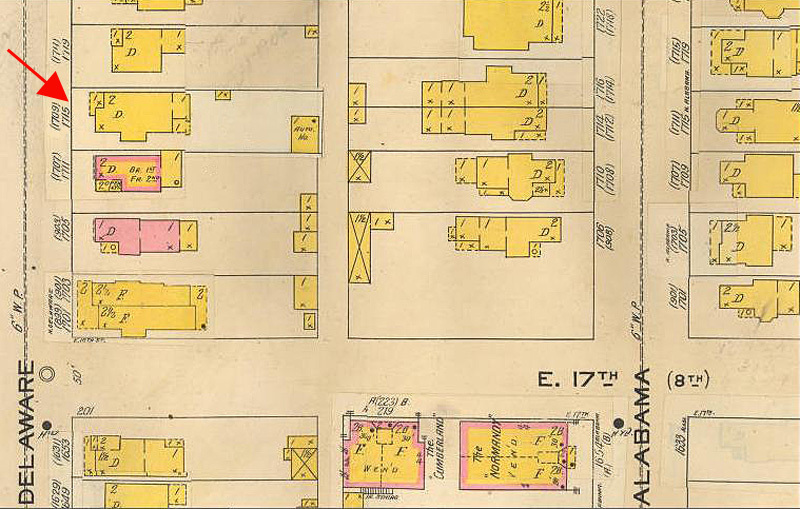 In the 1890s, the former Camp Morton was divided into building lots with the legal description of Morton Place Addition. The residence that today is known as 1713 North Delaware Street was built in 1894 and 1895 by John E. Milnor and his wife, Nellie M. Warner Milnor. 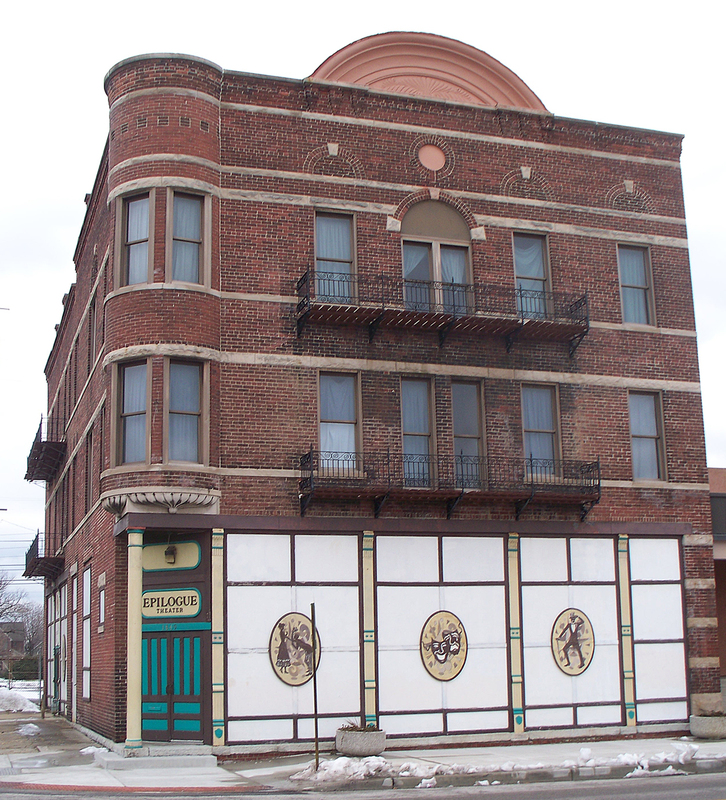 At the time of its construction, the address of the property was 907 North Delaware Street. Due to renumbering of street addresses over the years, the home has also been known as 1709 and 1715 North Delaware Street, as well as 1713. John Milnor worked for Charles F. Sayles & Company, whose offices were located at 127 E. Market Street. The firm handled insurance and real estate sales, as well as home loans. Milnor’s wife Nellie’s maiden name was Warner. On the 1910 Census, the Milnors’ neighbors included Nellie’s sister Kate Warner Fincock and husband Samuel Fincock, who lived at 1711 North Delaware Street, and the two women’s brother, Joseph Warner, who lived at 1714 North Delaware Street. 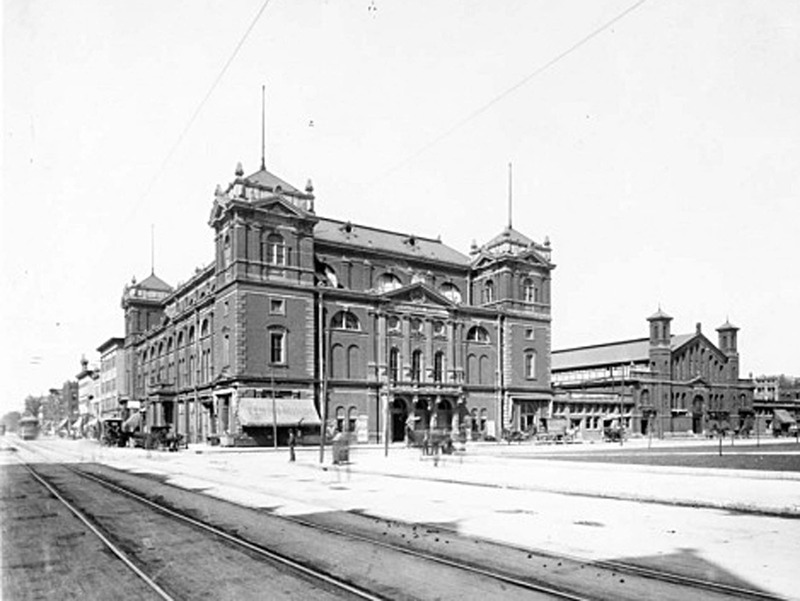 John and Nellie Milnor’s daughters — Irene, Jessie, and Marian — attended nearby Tudor Hall School for Girls at 16th and Meridian Streets and Shortridge High School on Pennsylvania Street between Michigan and North Streets. The Milnors resided in the home at 907 / 1709 / 1715 / 1713 N. Delaware Street from 1895 until 1918, when they moved to a new home at 3018 Fall Creek Boulevard in the Jose-Balz Addition. 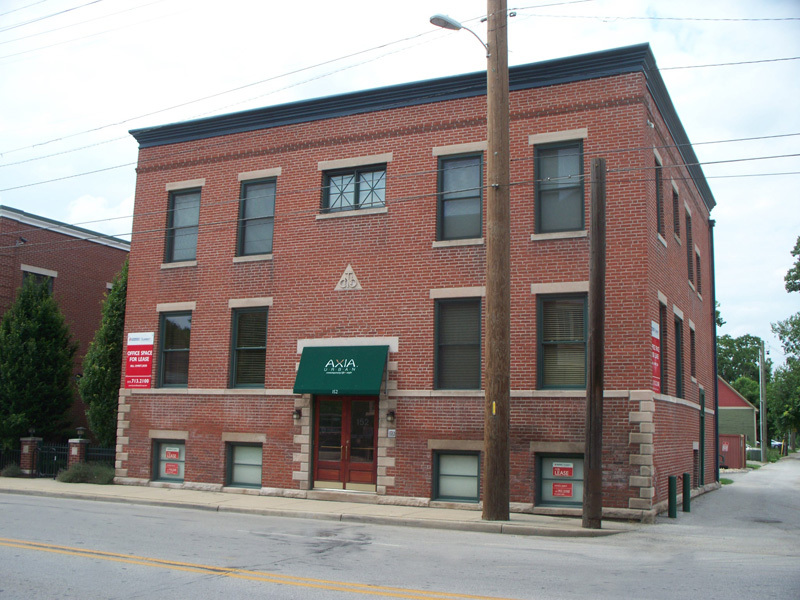 In 1918, the owners of 1715 N. Delaware Street were Howard L. and Josephine Baldwin Holcomb. Howard was the President of Holcomb-Siess Ford Motor Cars, Parts, and Service, which was located at 533-537 N. Capitol Avenue. In the 1919 city directory, the residents of the home were Ebenezer B. and Barbara Baldwin, who were Josephine’s parents and Howard’s in-laws. By the time of the 1920 Census, the four were living together in Anderson, Indiana. Howard and Josephine were working for an auto company, and her parents were retired. In 1920, the owners were J. W. D. Aspy, a livestock dealer, and his wife Flora. Their 26-year-old son John A. M. Aspy lived with them. John was a physician with an office in the Hume-Mansur Building. The Aspys remained in the home until 1926. After the parents passed away, the son took up residence in the Columbia Club on Monument Circle, a short walk to his medical practice on East Ohio Street. From 1926 to 1938, the owners of the home were Joseph F. O’Mahoney and his wife Evelyn O’Connor O’Mahoney. Their children were Joseph F. Jr., Ruth E., William P., Robert M., and James R., The O’Mahoneys operated a restaurant at 1531 N. Pennsylvania Street (now the site of the Varsity Lounge) and a tea and coffee house at 214 E. Market Street (inside the now-demolished Tomlinson Hall). In 1939, the family moved to 1831 Alabama Street, the first house south of Footlite Musicals. 1715 N. Delaware was listed as vacant in the 1939 city directory. By the time of the 1940 city directory, it would appear that the home had become a rooming house, as four names were listed as residing there. Tenants were Whitt H. Hazelwood, Margaret J. Amon, Eugene Lewis, and Ralph Gardner. In the 1951 city directory, John Ward, a gardener for a private estate, and his wife Marie were the home’s owners. From 1958 to 1960, William B. Sullivan and wife Mary Gabelle Sullivan were the homeowners. Sullivan was a sales rep for Blue Cross-Blue Shield. The next owner was Jack L. Jarrett, who owned the home by himself until 1974. From 1974 to 1988, Jack L. Jarrett and Robert M. Schoen Jr. owned the property together. 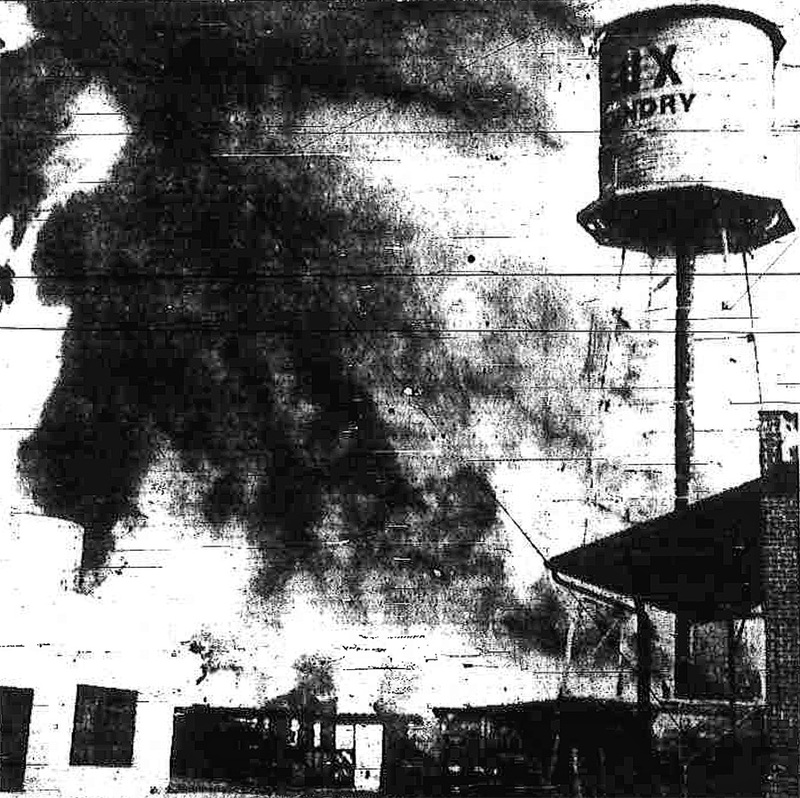 From 1988 to 1990, Schoen alone owned the property. I could find no information online on Jarrett’s occupation. Schoen was an architect, as was his father, Robert M. Schoen Sr. In 1976, during the time period of the Jarrett and Schoen ownership, the residents of Herron-Morton Place formed a neighborhood association. 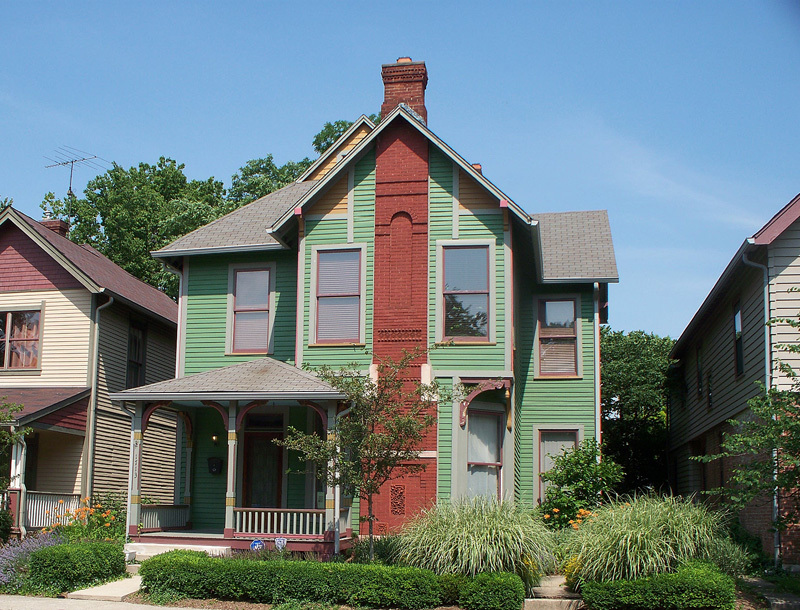 The area was listed on the National Register of Historic Places in 1983 and became an Indianapolis Historic Preservation Commission Conservation District in 1986. From 1990 to 1998, Larry Gregerson was the owner of the home and did extensive renovations to the property. For a brief period after Larry’s stewarship of the property, 1997-1999, Paul E. Leonardi was the owner. Since 1999, a history professor at Butler University and his wife, an attorney with the Indiana Court of Appeals and an Adjunct Professor at Indiana University School of Law, have made 1713 North Delaware Street their family’s home. Out of respect for their privacy, I have not included their names here. This article and a portion of this website are generously sponsored by Larry Gregerson, Realtor®. You can visit his website here. Awesome; thanks Sharon. You guys are disrupting my “work”. I mean, this is the most amazing answer to a question about . . an address on Delaware St.! I mean, I am easily distracted by these posts. In a good way. Good job, as always, Sharon! I love the fact you took it all the way back to the Northwest Territory! Sharon: Loved it–and it suddenly kicked up a memory of a wonderful story regarding a home in the next–1800 block of N.Delaware–I do not recall the exact address but here is the story with its “missing parts” perhaps available if it is of interest to you. I don’t know how familiar you are with a small private group called The Players, but this architectural “first” came to my attention some years back when I was among members asked to do some research in the group’s minutes (wonderful reading!) for I think the 50th year anniversary yearbook. Then, more recently, wonderful local writer and fellow Players member Nancy Kriplen did the 75th year update–and at that time the story of “the house” and its linkage came up again. If you know Fritz Gordner (and who does not?) he absolutely does know more exact details, address etc. plus an interesting bit from when he was president of Players some years back. So if you find this of interest, if any better informed of your audience knows more exact, accurate details this is only my scatty recollection. But as I drive north past l6th I have always wondered which house it was–and as I recall, when Fritz G. was Players president on some hallmark year, he actually planned a cocktail pre-party there–but before my time or else it was an idea shot down (perhaps by members who didn’t relish driving “that far” downtown. I am sure you are correct that it was Herbert Foltz, as I recall coming across mention of the Players in some of his papers at the Indiana Historical Society. As historian of Herron-Morton Place, I’ve done a good deal of research on a number of our residents and Foltz is one who intrigued me in many ways. He lived at 1847 N. Delaware (most certainly not out in the country by the early 1900’s, not sure what that’s about), but the home was gone by the 1970’s. In its stead is a lovely arts and crafts style custom built home with a spacious side lot (essentially the SE corner of 19th & Delaware). I would LOVE to get ahold of any Foltz relatives and/or photos. He was a prolific Indy architect, and the collection of his known works in the city has been greatly diminished in the past few decades. If you can put me in touch with someone who might be related, I would be most grateful! Thanks for the reminisce. I can give you some information about the Foltz family. Herbert Foltz (1867-1946) and Clara Bowen Foltz (1869-1935) had two daughters and one son. Their son, Howard Franklin Foltz Sr. (1903-1994) was also an architect. Howard had four daughters and one son: Margery Foltz Allerdice (1926-2008), Virginia Foltz O’Brien (1928-2009), Joan Foltz Shoptaugh (1929- still living), Betsy Foltz Shasberger (1931- still living) and Howard Foltz Jr. (1935- still living). As far as I know, Howard Foltz Jr. is the only one of Herbert’s grandchildren who still lives in Indianapolis. “Buzz” oversees the Foltz Foundation, which operates a nonprofit organization called Quest for Excellence at 2051 N. College Avenue, 283-5730. I can give you Buzz’s personal contact information at home, too, but I will provide it privately if you can’t reach him at work. Herbert’s wife Clara died in the ’30s, but Herbert remained at 1847 N. Delaware Street until the end of his life. He lived in the house that he built in the first few years of the 1900s for nearly half-a-century. Son Howard Sr’s family lived at 3246 N. Pennsylvania Street from the 1930s to the 1960s. The children all went to IPS School 60 and Shortridge High School. Their beautiful, brick, center-hall entry Colonial home is no longer there. It was purchased by St. Richard’s School and later demolished, in order to enlarge the school’s playground. As noted above, Howard’s two oldest daughters are no longer living. Marge’s son, John Allerdice, and daughter, Noni Allerdice, have been my friends since our Shortridge High School days. John lives in Lawrenceville, Georgia, and Noni lives in Eugene, Oregon. Jinny O’Brien’s only daughter is six years younger than I, so we weren’t at Shortridge at the same time, but I knew the O’Brien family from their active roles at Tabernacle Presbyterian Church. Jinny’s daughter, Karen O’Brien Fanning, lives in Carmel. I can give you contact info on John, Noni, and Karen, privately. I would start with Buzz Foltz, though, since he is of the earlier generation, and is in town.